The rules of our Five Questions interview series are simple: we send authors a long list of questions. Some are serious; some are . . . not so serious. They choose their five favorites (or in this case, eleven favorites — bonus!) and respond. Our guest today is children’s poet and author Lee Bennett Hopkins, whose new picture book collection of Christmas poems for children is entitled Manger. What inspired you to create Manger? Since childhood years I have always been fascinated with the legend that God granted all creatures the power of human thought or speech for just one hour on Christmas Eve. To share the legend, via poetry, with children today is indeed a privilege. How and why did you choose the title for the book? 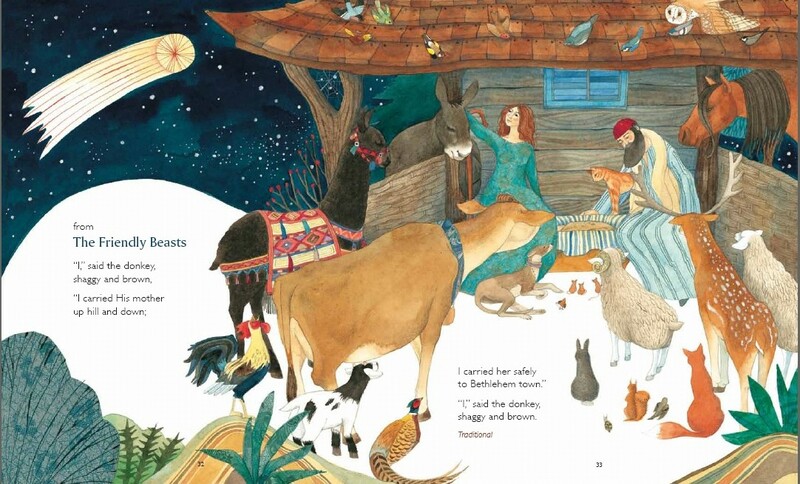 I wanted all the poems and animals to be set in the manger when Christ was born. What makes Manger such a unique volume? Eleven of the poems were specifically commissioned for this collection by some of America’s top contemporary poets including Marilyn Nelson, Alice Schertle, and Alma Flor Ada. What are your thoughts on Helen Cann’s illustrations? Cann’s incredible artwork truly leaps from the pages. Her work is stellar — perfect for Manger. Interior illustration from Manger by Helen Cann. Whom do you envision reading Manger? Adults as well as children of all ages will find poems they will love. What do you hope readers take away from Manger? I want readers to sense the beauty and emotions of fine poetry. Why did you choose to publish Manger with Eerdmans? I published a previous book, Mary’s Song, with Eerdmans, a company and staff which is a delight to work with. What’s something not enough people know about writing poetry for children? Writing poetry for children is an art. It is one of the most difficult forms of writing to conquer. What are you reading right now for work? A host of books of prayers. Imagine you’re at the book talk of your dreams. Who’s the author? What’s the book? And who are the people sitting next to you scribbling witty notes on their programs? Langston Hughes is reading from his book, The Dream Keeper and Other Poems (Knopf, l932). He opens the new 75th Anniversary edition, illustrated by Brain Pinkney, and finds the introduction — written by ME! What’s one thing not many people may know about you? If I tell, they’ll know! Click to order Lee Bennett Hopkins’s Manger, illustrated by Helen Cann.